Rufus Collins is an American actor who played Adrian in 2012 in the episode The Long Fuse of the TV series Elementary with Jonny Lee Miller as Sherlock Holmes. 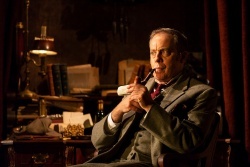 In 2018, he played Sherlock Holmes in the play Sherlock's Last Case with Mark Zeisler as Dr. Watson. This page was last edited on 13 November 2018, at 00:30.